While water management is challenging enough as it is, climate change makes it harder. No longer can we rely solely on experiences from the past to guide our actions, but we must also consider forecasts of the future. 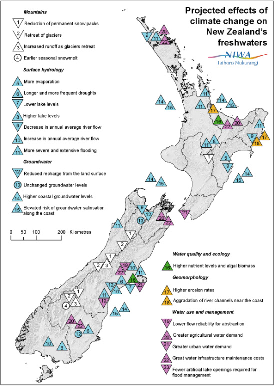 And with New Zealand’s water resources expected to change in the coming decades – well within resource management planning horizons – it would be prudent to start to adapt sooner than later. So how does climate change affect the ways water may be governed, and how are current governance systems placed to deal with climate change? Map of projected freshwater impacts of climate change. First up, let’s review the potential effects. As the climate changes, temperatures are expected to rise and rainfall patterns shift both regionally and seasonally. This would result in more flow in some rivers and in some months, and less in others. Similar effects can be expected for our groundwaters too. In much of the country, droughts are expected to become more severe (PDF). Paradoxically, so too are floods, in part as warmer air is capable of holding more water, leading to more intense storms. Water quality is expected to decline in some lakes, and erosion may increase, though there has been much less study on this. As for the implications of climate change for our aquatic ecosystems, the jury is basically out at this time due to limited research. And in general, gradual changes in freshwaters will be combined with increasing uncertainty about the future as we move further away from past conditions. These potential impacts would have implications for the amount of water that can be abstracted, the amount of nutrients that can be discharged, the productivity of both agriculture and hydroelectricity, flood and drought risk, and the natural character of the landscape. This would affect the social, cultural, economic and environmental values of New Zealand’s freshwaters making the balancing act all the more difficult. But the need to take heed of climate change when managing resources is being recognised, with climate change becoming part of major national governance documents. The Resource Management Act, amended in 2004, directs councils to “have particular regard to [sic] the effects of climate change“. The National Policy Statement for Freshwater Management 2011 (NPSFM) requires councils to have regard to “the reasonably foreseeable impacts of climate change“. Consequently, more specific references to climate change have been appearing in regional documents too, referring to both flooding hazards and water shortages (e.g., Taranaki Regional Policy Statement, section 7.2). And as councils respond to the relatively recent NPSFM, we can expect to see more consideration of climate change in future policies and plans. Along similar lines, the non-governmental Land and Water Forum acknowledged the significance of “changing weather patterns” in its first report, which could be interpreted as climate change or as climate variability (e.g., ENSO, IPO). In its third report, the LWF recommended that water quality management take climate change into account (where the science vastly lags the policy aspirations), while water allocation (where the science of climate change impacts is clearest) only considered climate variability. foster resilience and robustness among water users and management regimes. Putting these strategies into practice is going to take time, and regional councils and other governing bodies and advisory groups are taking the first steps on this journey. Progress will depend upon the science providing the necessary answers, and existing science being better translated into policy solutions. In either case, the science plays a fundamental role in assessing impacts and alternative interventions, and thus informing the governance process. Collins, D.B.G. ; Woods, R.A.; Rouse, H.; Duncan, M.; Snelder, T.; Cowie, B. (2012). Chapter 8. Water Resources. Water resource impacts and adaptation under climate change. In: Impacts of Climate Change on Land-based Sectors and Adaptation Options. Clark, A.J. ; Nottage, R.A.C. (eds). Technical Report to the Sustainable Land Management and Climate Change Adaptation Technical Working Group, Ministry for Primary Industries, Wellington, pp 347 – 386. Dr Daniel Collins is a hydrologist and water resources scientist at NIWA. Interesting read, however the link to “the balancing act” should be to s5 RMA not s7 RMA.